Raising a memorial to her parents was important to Mary McDonald. Her father had died when she was just a toddler, but her mother passed away when Mary was in her 20s. 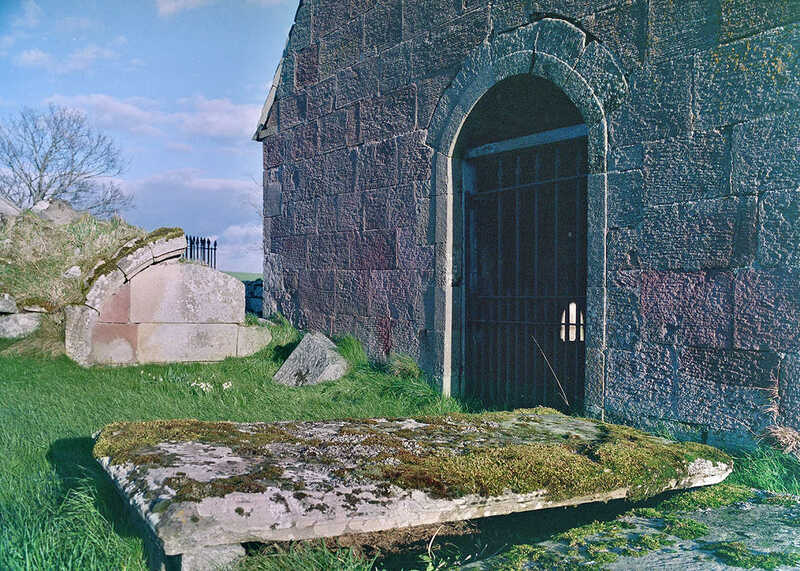 At a time when most people were buried without any memorial at all, Mary managed to fund the erection of a respectable tablestone at Kirkmichael. It was not in a favoured spot. The area immediately to the north of kirks in our area traditionally was the least popular location for burials, and Kirkmichael, one of the most crowded of kirkyards, contains only a few memorials close to the north wall of the building. You can’t get a pin between all the memorials on its south side. Although the siting was not ideal, Mary would have felt quite rightly that she had honoured her parents. She died a pauper, and as a dairy maid and farm servant she would never have had access to much money. All the more remarkable then that she could save enough to afford a tablestone, reserved at that time for well-to-do tradesmen and tacksmen. And all the more tragic that the memorial was shattered by an unthinking workman in the 1980s. 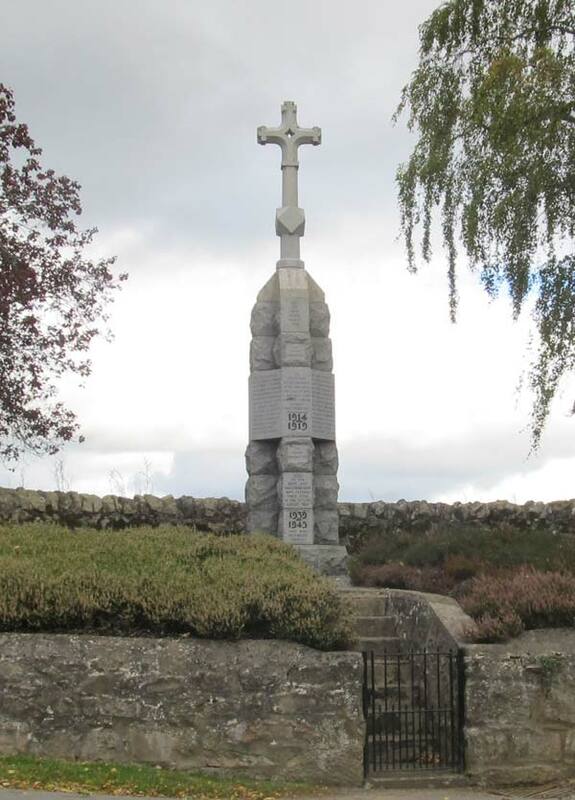 The instrument of this destruction was the great granite urn that topped the memorial to Lieutenant General Sir Hugh Fraser of Braelangwell and his wife, Dame Isabella. Their massive memorial collapsed (and did it fall, or was it pushed?) before 1906, the postmark on an early postcard featuring Kirkmichael. The component parts became separated, and in a photograph taken in 1959, the urn and the crown on which it sat can be seen against the west chancel wall, in front of our recessed arched tomb. For some reason the urn migrated further to the east. At some point, to get it out of the way, presumably for ease of grass cutting, it was dumped on top of the McDonald tablestone. The tablestone shattered. 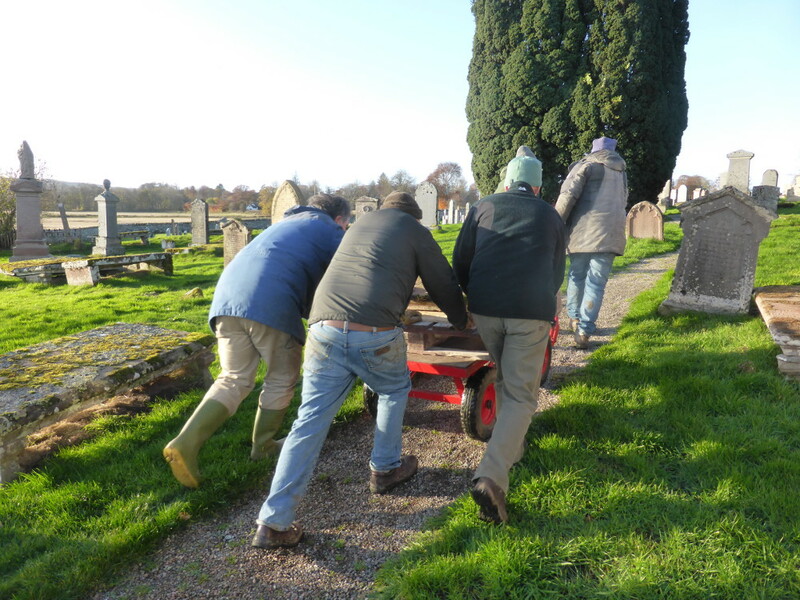 We think this heavy urn may have been lifted off several times by visitors unhappy with the situation, but dumped back on again by grounds maintenance staff for convenience. I remember when recording the inscriptions of stones at Kirkmichael a few decades ago I had to lift the urn off the crushed stone myself. No easy task. 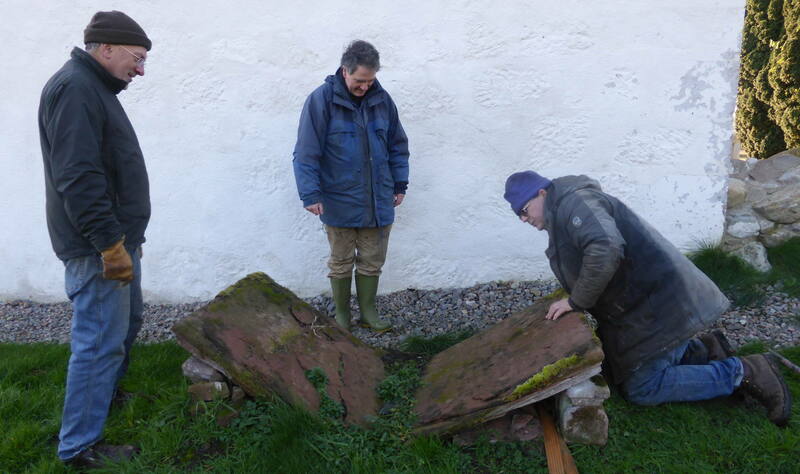 The tablestone in 2017 – impossible to repair? 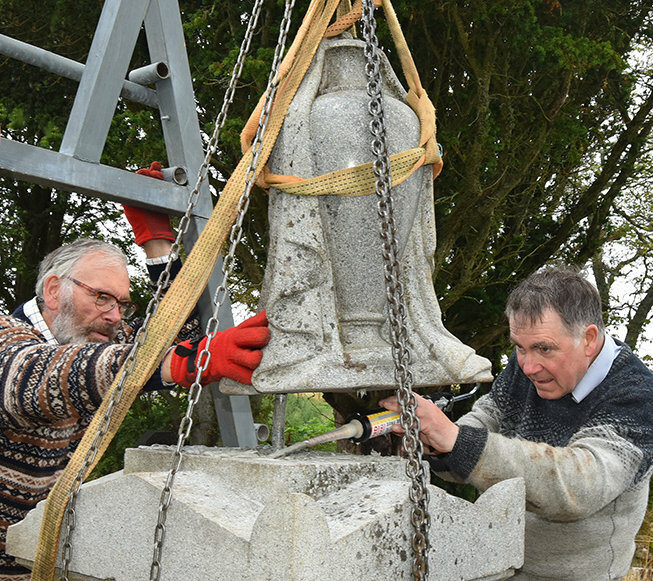 When Trust volunteers re-erected Sir Hugh’s memorial in 2018, we winched the urn back up to the top of the memorial and secured it with both a stainless steel pin and anchor resin. The shattered tablestone presented a real challenge. It was an eyesore. 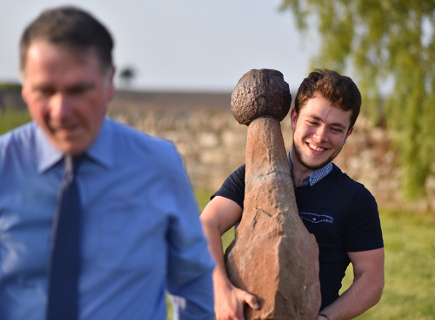 I remember when showing the Duke of Gloucester around Kirkmichael in April 2017 at our Royal Launch, HRH asked what we were going to do with it, and I assured him we were indeed going to fix it. Somehow. The trouble was that it wasn’t a case of just joining two halves together – the way it had shattered had resulted in all the layers separating. 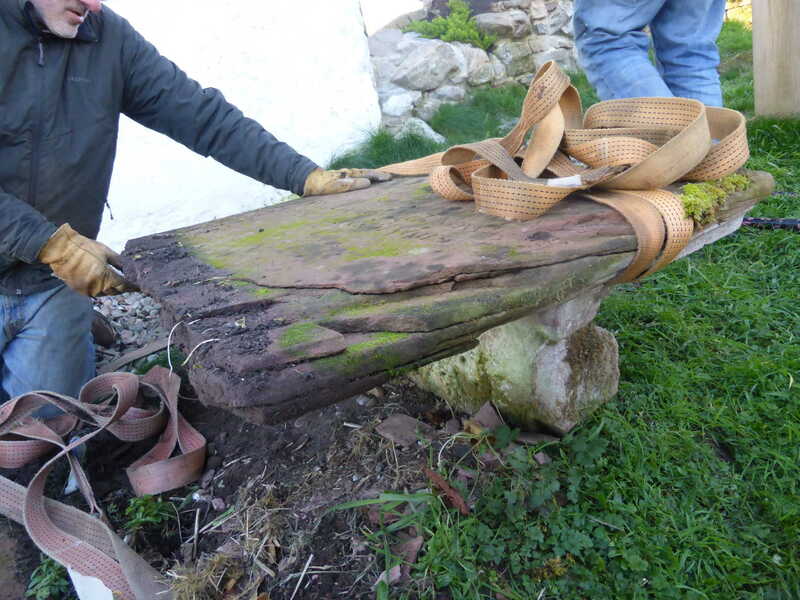 step one was to remove the tablestone to dry out inside – but how to shift? 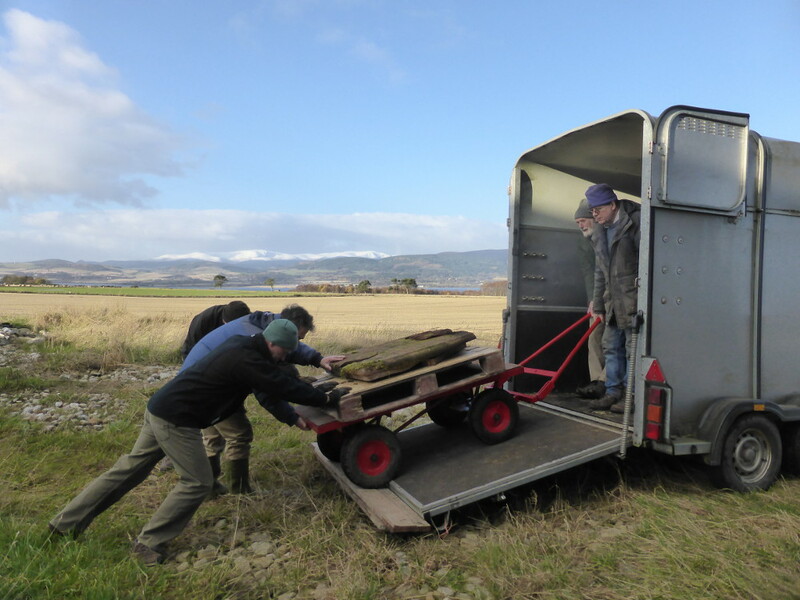 In winter 2017 we lifted each half onto a pallet, filled several sacks with all the shards, and placed in a shed to dry out. The base half was in far worse shape – it had fragmented. it became clear just how comprehensively the tablestone had been ruined. 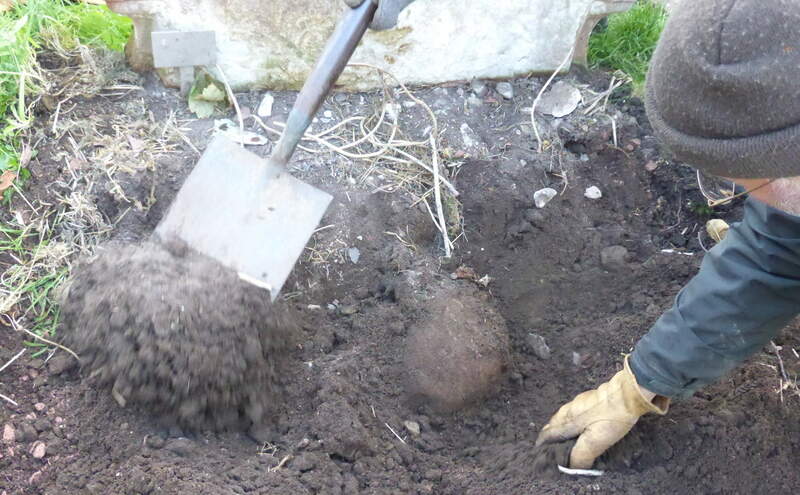 Interestingly, we found buried under it the ball of the finial from the original west wall of the church. The whole wall except for its base had disappeared some time after 1906, but we found the three parts of the broken finial disposed of under three widely dispersed tablestones. 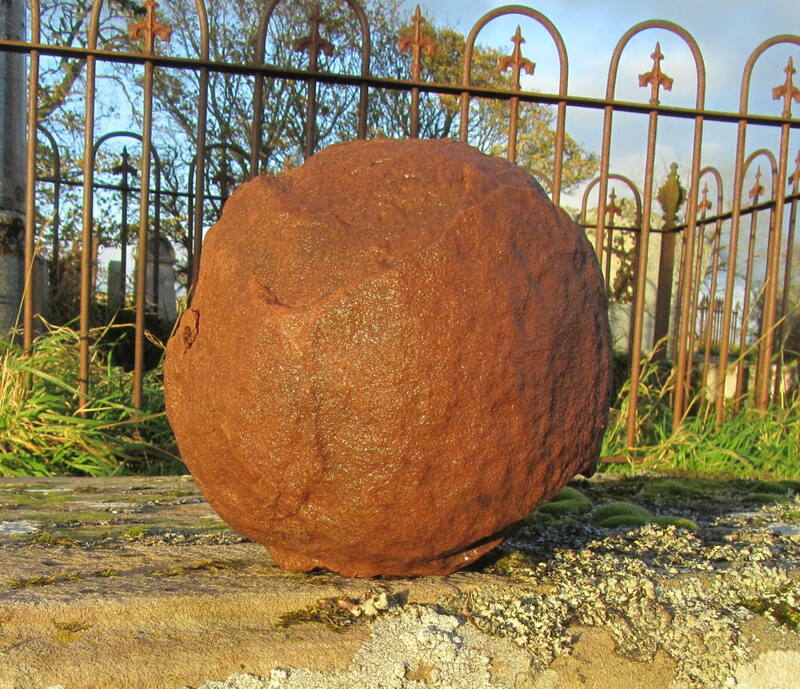 The ball we found under the McDonald tablestone. The first glimpse should have given us a clue that this ball had been part of something larger. 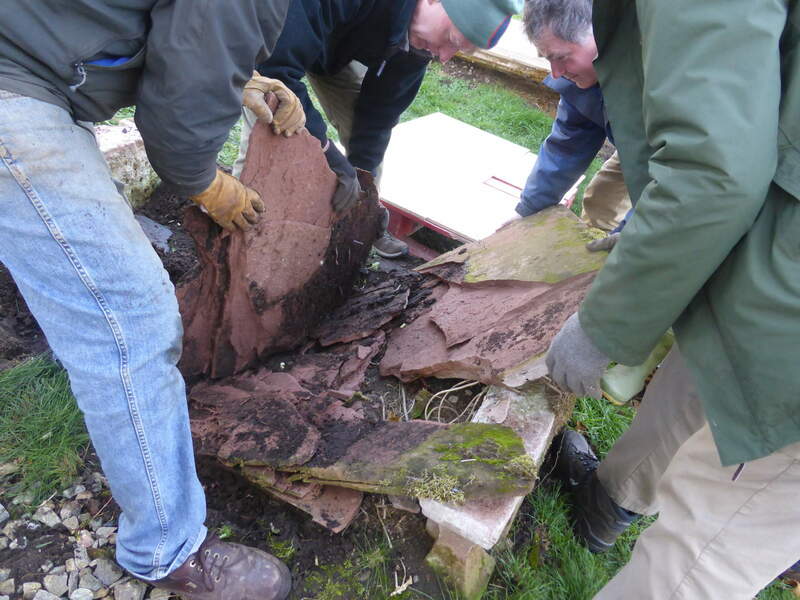 There had been some damage from the broken tablestone coming down on it, but we did manage to fix it. It was quite a surprise, as initially we didn’t realise they fitted together: first we spotted that the two parts of the pillar fitted together perfectly but it was some time before the final penny dropped – it came to me one evening, and the next day I excitedly went down with the ball to try it on and the broken parts fitted together exactly. and then we twigged it was from the bell-tower on the original west gable. 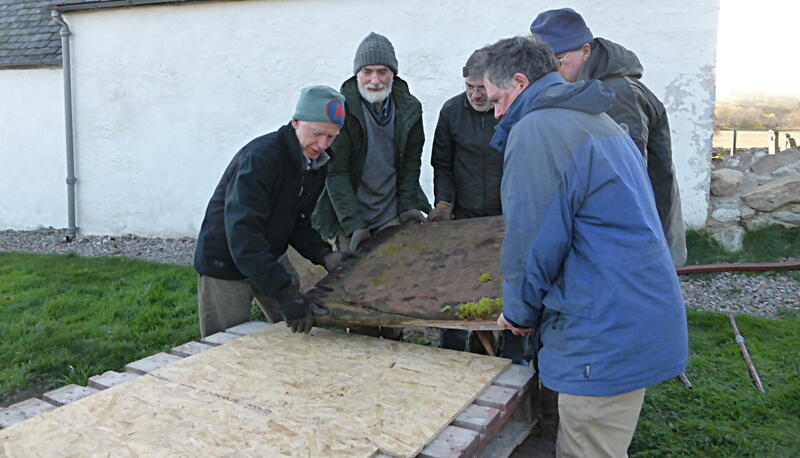 The tablestone lay in a hundred pieces in the shed while we pondered different approaches to putting it back together again. Whilst I was tempted to have a go, the poor condition of the sandstone itself meant that even if repaired it would never be secure. We decided that the best option was to have a new tablestone slab carved. We were not aware of any such exercise being carried out before, so it had the spice of novelty. There was a respect issue as well. We try to treat all our memorials respectfully. They all represent the affection a family felt towards their departed. A patchwork stone roughly pieced together would not be particularly respectful. A new memorial, replicating what was there before, seemed the best solution. And we had the intention of sliding the section bearing the original inscription back under the tablestone so that it could be inspected if needed. Most tablestone slabs are six feet by three feet. 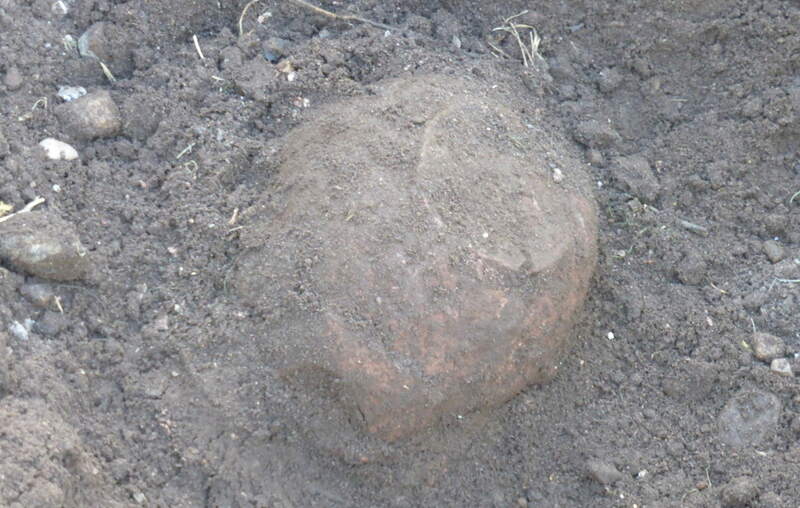 Earlier stones have all sorts of shapes, but by the time tablestones became popular they had standardised. The job was, then, to commission the carving of a new tablestone six feet long and three feet wide! Update January 2019: after investigating availability of stone carvers and prices, we were delighted to renew our working relationship with David Lindsay of Stoneworks. David and Richard Groom of Stoneworks carved the two “new” medieval stones that grace our seating arrangements in the nave and chancel. The slab is currently being ordered from the quarry, and we shall keep you up-to-date as the carving commences. Stone carving does not come cheap. To keep costs down, we are delivering the inscribed half-slab to David’s workshop and will be installing the new slab ourselves. We have received a small proportion of the total amount so far, so keep those donations coming! Fixing Mary McDonald’s memorial is tough, but it has been just as challenging to find out anything about either her or her family. There appeared to be nothing to say where they lived, what their occupation was, where they had come from or what had happened to Mary. 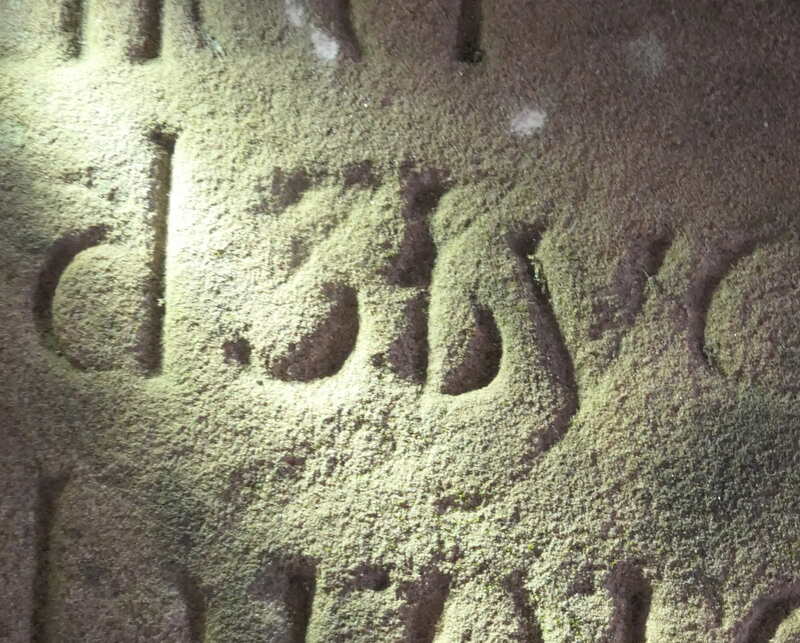 The second “3” of “33” looked as if there had been at some time confusion by the carver over if it should be a “1” or a “3”. From the spacing between other words and characters, I think a “1” was carved initially, and later this was replaced with a “3”. A rather bare family tree! And so it remained for a long time, as the family did not appear in any of the Resolis registers or other sources of information gathered over the years. When we were looking to re-carve the stone, I revisited the search, and cast my net wider. 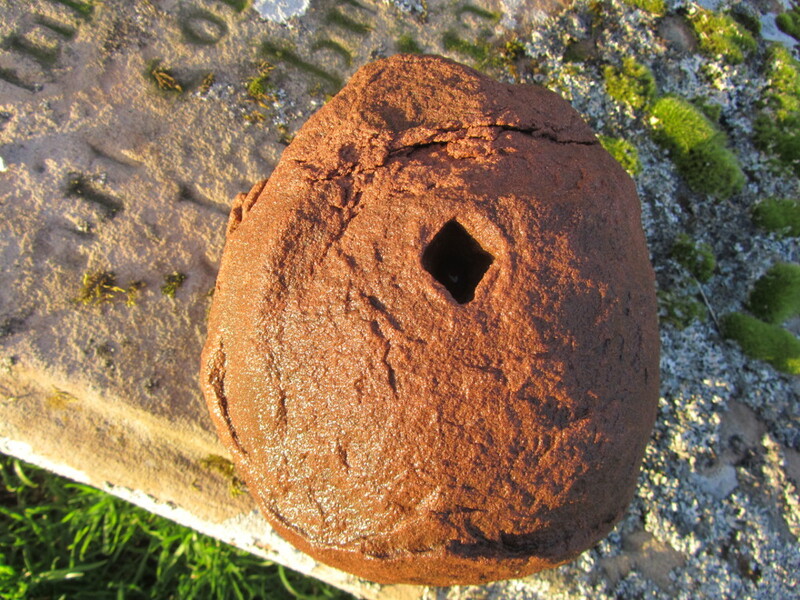 I was lucky to come across the entry for Mary’s death in 1865, across in Easter Ross in the parish of Fearn. It is definitely she as all the data fit perfectly and further information confirmed any residual doubt. However, what was she doing across in Easter Ross? The clue is in the informant: she had crossed the Cromarty Firth to live with her nephew’s family. With that information, it was possible to track her down in the census returns. In 1851, she was living in the household of the aforesaid Donald Ross and his siblings. Donald was a shoemaker at Balmuchy, Fearn, and Mary McDonald was given as “Aunt”. In turn, the death certificate completed for Donald Ross demonstrated his mother was indeed a McDonald: his parents proved to be John Ross and Catherine McDonald. He died in Rosskeen in 1879. What a job it had been to find the right Donald Ross in an area filled with men of the same name! 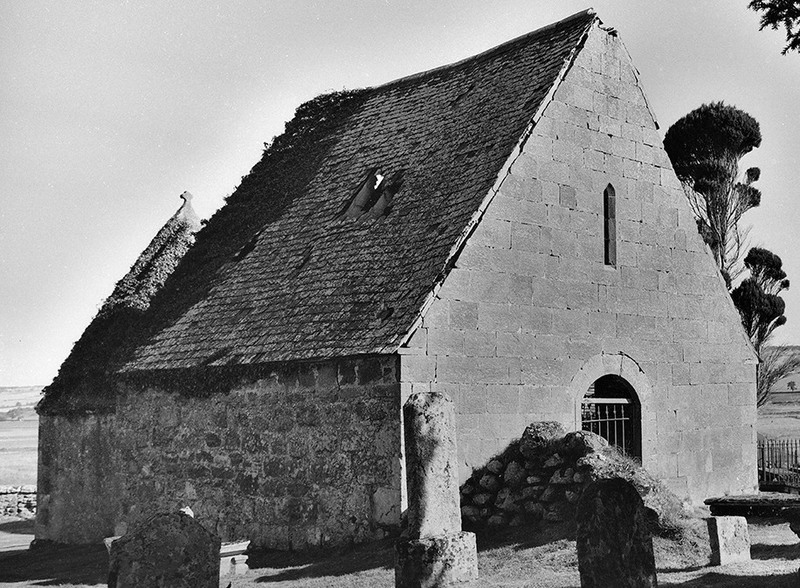 In turn, his parents’ marriage was located from this information – John Ross and Katharine McDonald married on the 30th November 1810 in the parish of Tarbat in Easter Ross. From the census returns, John and Catherine clearly had numerous children, but the baptism records are a poor source: only one can be found : Margat, baptised in 1812 when they resided in Arboll, parish of Tarbat. From his age given in various sources, Donald must have been born about 1819. With the 1851 census return, I was able to trace the family back to 1841 – Donald Ross at that time was an apprentice shoemaker living with another family locally, but the remainder of the family, plus their parents, were in residence in Fearn. Mary McDonald had not yet joined them. She was not in Resolis in 1841 either, so her whereabouts still have to be discovered. Donald Ross having served his apprenticeship rejoined the family so that all four siblings were together in 1851. However, after Donald married Isabella Denoon in 1853 his brother and sisters moved out. Mary McDonald continued to live with Donald’s new family, appearing in the 1861 census returns, again given as “Aunt”. On the 1851 census her parish of birth had been given as “Fearn”, which was presumably an error, as on the 1861 census, fortunately for my confidence, her parish of birth was given as “Resolis”. It is always comforting to get confirmation you are on the right track! The 1861 census gives several, but by no means all, of the children of Donald Ross and Isabella Denoon, and there are many descendants. Mary’s age of course varied on different forms. In 1851 it was given as 56, in 1861 as 75 and on her death certificate, in 1865, as 78. I would be minded to follow the death certificate as it is often the most accurate. It also fits with someone who died of that well-known disease “old age” which I note she had suffered from for, not surprisingly, “several years”! In 1881, the family of Donald Ross and Isabella Denoon were living at Ardross Cottages, close to Ardross Castle, and the two sons are under-gardener and under-forester, presumably with the Ardross Esate. Very shortly Ardross Castle would be rebuilt and Ardross Cottages expanded to accommodate the Irish work-force and became the modern village of Dublin. The widowed Isabella and her sons spoke Gaelic at this time, although this was not the case for the two daughters. 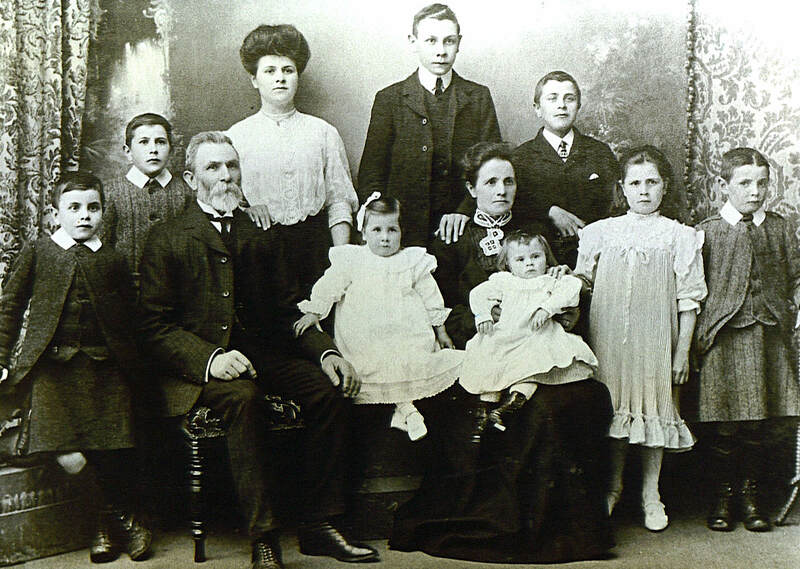 One of Donald’s daughters, Margaret, married in 1888 a house carpenter from Beauly called Hugh MacRae, and their family history has been recorded by descendant Gordon MacRae who, upon my making contact with him, has kindly allowed me to reproduce the photograph of the family below. While I had no family photographs, I was able to reciprocate with information on the earlier origins of Margaret’s family. Another McDonald family connection emerges from the 1851 census return. 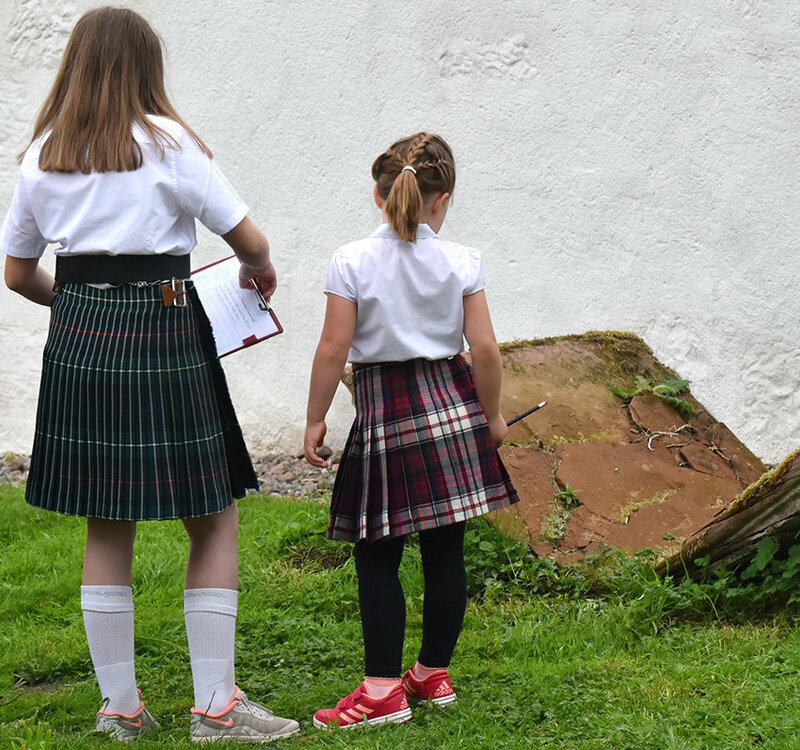 It identifies a person of interest, a 12-year-old boy called Donald McDonald, born in Cromarty, who was the cousin of Donald Ross. Assuming “cousin” means “first cousin” (this is not always the case), Donald McDonald’s father had to be a brother of Donald Ross’s mother, Catherine McDonald. Young Donald McDonald gave me a lot of trouble to track down, principally because his age in the 1851 census should really have been given as 14 rather than 12. Later census returns show that the three children Margaret, Christina and Donald all spoke both Gaelic and English. Their father George, I think, died before 1851. Jean was still in the parish of Cromarty in 1851 and 1861, in company in each case with her daughter Margaret. In 1851 they were living at Peddieston, but in 1861 their location is given as the now-disappeared “Sodom”. You might expect the next location to be named “Gomorrah” but disappointingly it was Davidston School! As Davidston and Peddieston are adjacent, I suspect that the family were in the same location, and that Sodom was merely part of Peddieston. In 1851 the census enumerator unkindly recorded her as unmarried, but she was correctly given as a widow in 1861. From her son’s marriage certificate we learn she died before he married in 1868, but I have been unable to find her death certificate between 1861 and 1868. As with all the rest of the family, information had to be teased out of the records. I think it likely that her parents were stone quarrier Alexander Treasurer (several times in the records spelled Treasoner) and Christian Urquhart, who lived in Culbokie and had children baptised there over the period 1802 to 1814 – Jane and Emelia were twins baptised on the 5th of November, 1802, giving an age which fits the 1841 census record well, although she is recorded as 55 in 1851 and 50 in 1861! If I could find her death certificate then her parents could be confirmed. 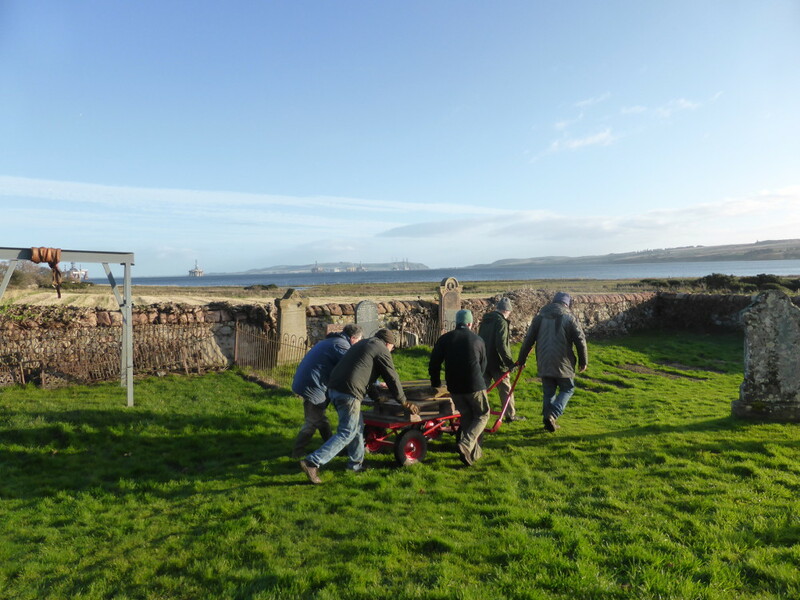 Several of these Treasurers or Treasoners moved to Resolis and will be buried in Kirkmichael. 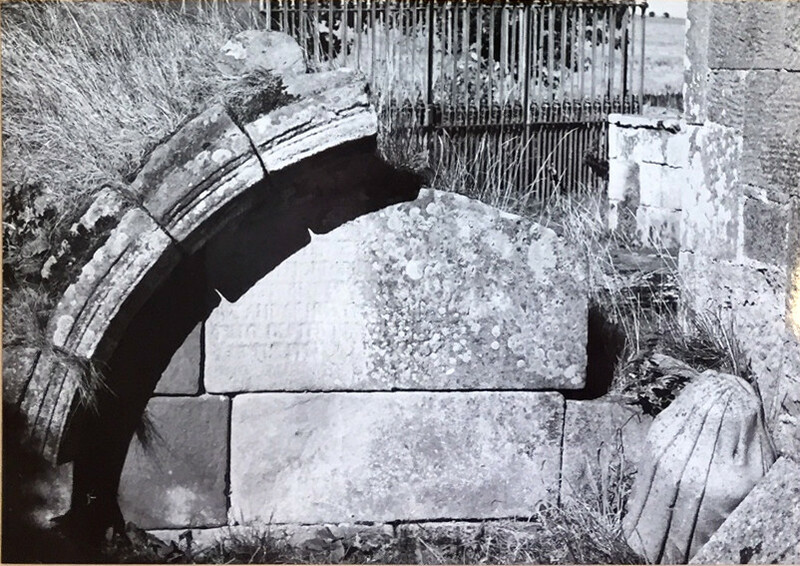 It is clear that following the death of George between 1841 and 1851, young Donald had been farmed out to the care of her relatives in Fearn where his aunt also had re-located. Sister Christina Stewart McDonald (1835–1922) was farmed out elsewhere. I picked up that she married agricultural labourer Pryce Cameron in Rafford (Moray) in 1859 while she was living at what seems to be written as “Shed” in the parish of Alves (Moray). Her marriage certificate unhelpfully says that while her father was George McDonald (deceased) her mother was Jane Fraser rather than Treasurer. However, in the 1871 census who should join the family but her sister Margaret, presumably following the death of her mother, and they are both given as having been born in Cromarty. And when Christina died in 1922, Pryce Junior provided the information regarding his mother’s family to the registrar, giving her parents as Donald rather than George McDonald (soldier) and Jane Treasurer. With inaccuracies like these it’s a wonder the family could be tracked at all. When she married in 1859 it is recorded that Christina could not write, so of course she could not tell if her mother’s maiden name had been written correctly. Nevertheless, marrying a Cameron with the unusual Christian name of Pryce deserved a medal, as they are so easy to track. Despite indexers reading his name as Price or Pryer! Curiously, “Pryce” appears to have been one of those names associated with high-flying Camerons, and I wonder if the name arose in this branch as a connection or a reflection of the usage in more socially elevated branches. Sister Margaret McDonald never married. She lived in the family with her sister Christina and Pryce Cameron until her death in 1892. I note that in 1891 she is recorded as speaking both Gaelic and English, like Pryce and Christina. Young Donald McDonald unsurprisingly became, like his cousin Donald Ross within whose family he was adopted, a shoemaker. He worked as a journeyman shoemaker, settling in the parish of Glass, Aberdeenshire (1861 census), where he married in 1868 a farmer’s daughter called Margaret Duncan (his marriage certificate fortunately confirming he was the correct Donald McDonald) and began to raise a family himself. The Parish of Glass lies a few miles to the west of Huntly, on the River Deveron. It contains Blairmore House, where the father of former Prime Minister David Cameron was born but which is now a place of refuge and prayer. Donald and Margaret had many children in Glass, although the family suffered in the First World War, with sons Duncan and Donald being killed and son Thomas wounded twice. The three were mature men when they joined up, and more information about them may be found on the excellent section on the war on the Glass community website. 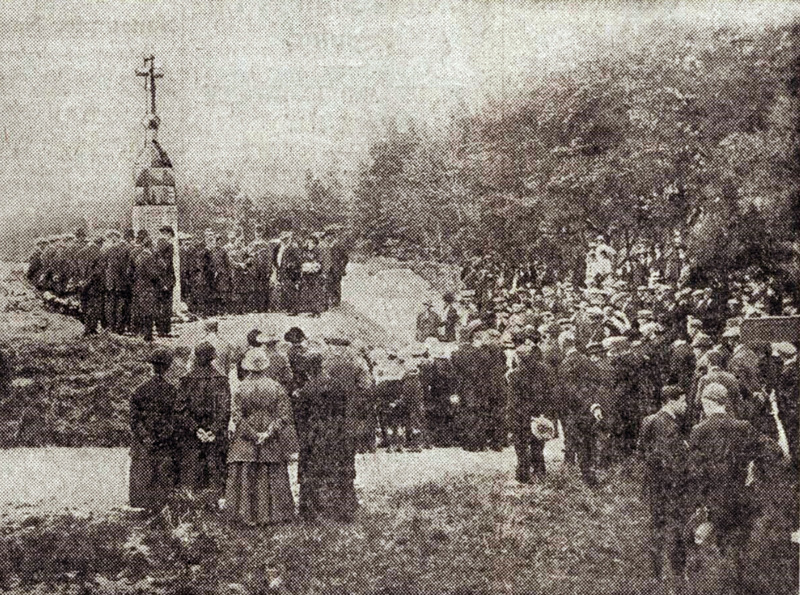 The image of the unveiling of the Glass War Memorial in 1921 (no doubt attended by the elderly Donald and Margaret) is from the Aberdeen Press and Journal of the time and of the War Memorial in more modern times is from the Kinnethmont website. and in more recent times. Donald McDonald never left the parish of Glass, residing in the Market Hill area for more than 60 years and dying there as recently as 1925 at the age of 88. 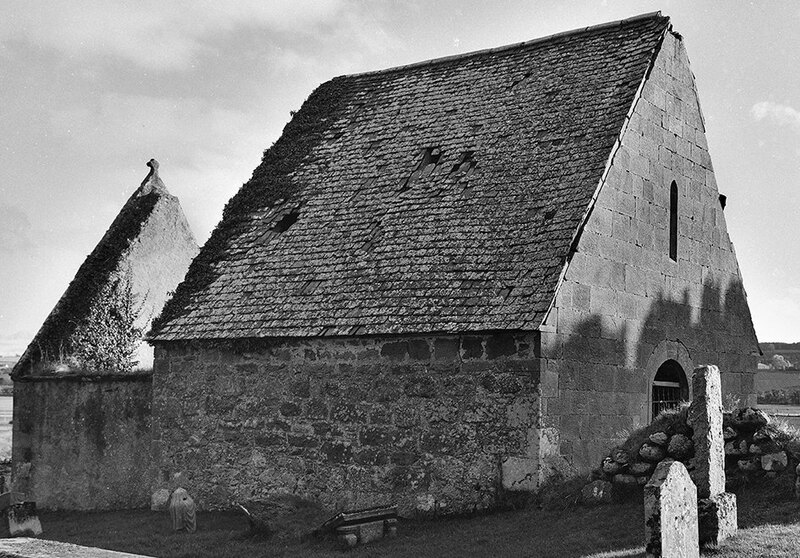 Anyone wishing to research Mary McDonald further could usefully investigate the Kirk Session and statutory parochial relief records for the parish of Fearn, held in the Highland Archives in Inverness. Pauper records can sometimes prove to be a treasure trove. I would be delighted to update this Story with any additional information on Mary. 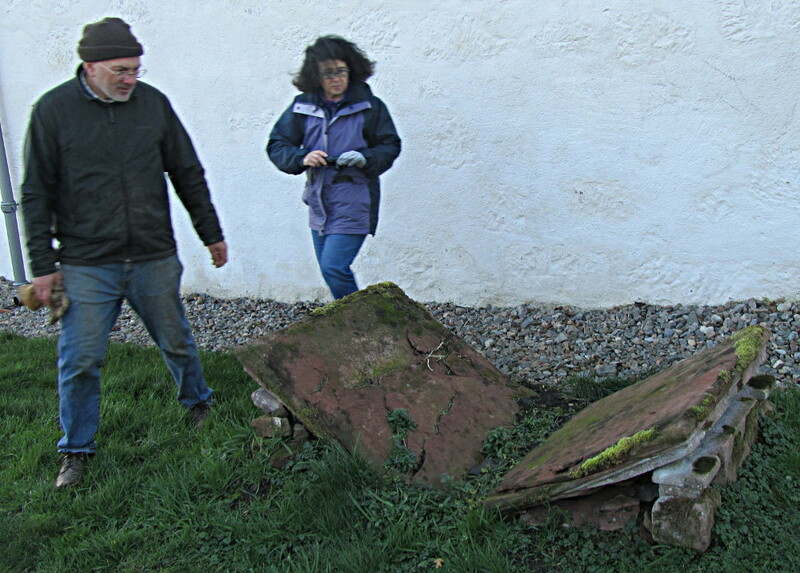 I return at last to the shattered tablestone in Kirkmichael. 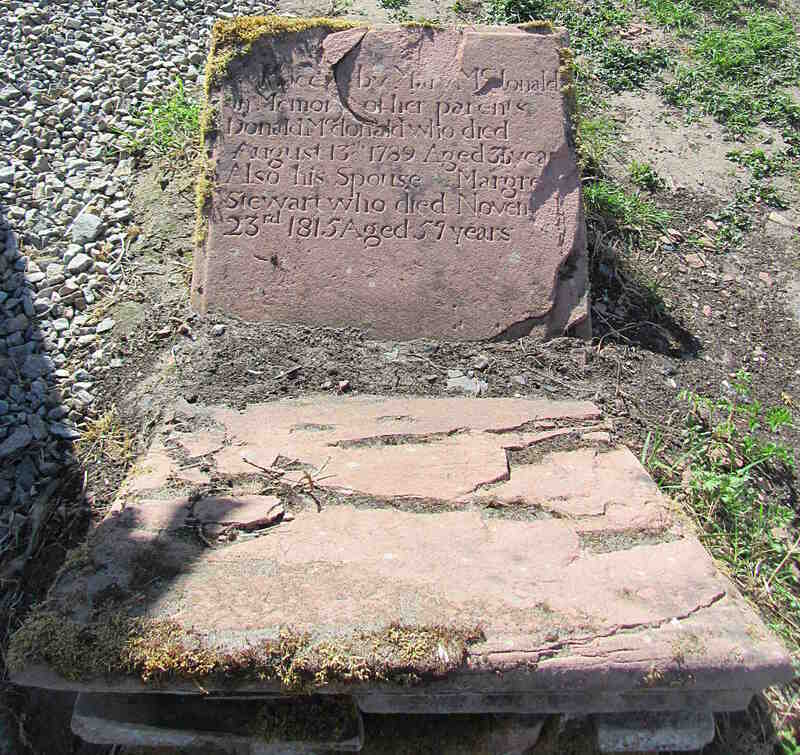 Both parents died in Resolis (again, this is only an assumption), and are buried at this location in Kirkmichael. Mary would have had the stone erected some time after her mother’s death in 1815 given the wording – she would have been about two when her father died and about 28 when her mother died. Clearly she received no assistance from brother George or sister Catherine in erecting the stone. It may, in fact, have been erected after both siblings were deceased. She is variously described as “formerly” “farm servant” or “dairy maid”, and she assisted in running the home at Balmuchy (in the role of “domestic servant”). She could never have accumulated much money. Her story is a sad one: her father dying tragically early, her mother also dying at an early age, her family scattered across the north and east of Scotland, and many of her relatives also dying young. Despite all this, and even dying as a pauper herself, Mary McDonald succeeded in leaving a worthy memorial to her parents. 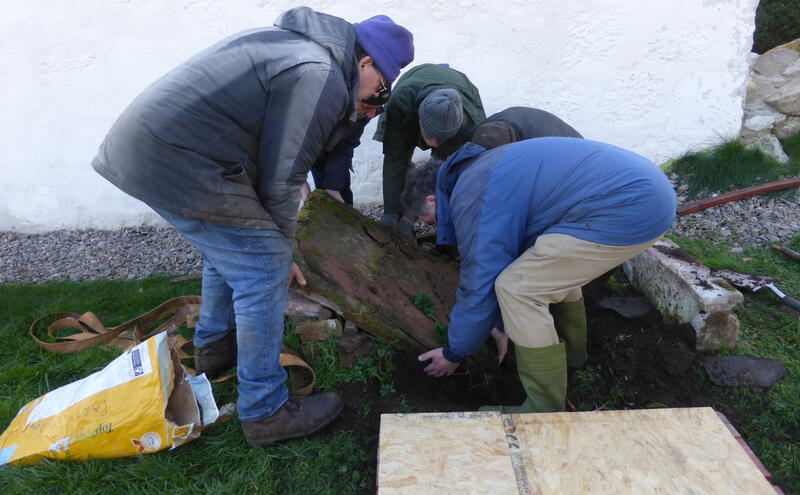 The Trust is now looking for contributions to replace the stone for which she had strived to find the money, shattered by the unthinking carelessness of a workman 40 years ago.